Do you have a well-lighted place in which to read? These days distractions are ubiquitous. It can be challenging to find a place to curl up and get lost in a book. All it takes is a corner of a room to build a reading nook. A quiet chair near a window is the ideal place to enjoy reading. Natural light is best for seeing print. Consider installing a window seat, a bench-like seat in front of a window that is great for story time with children or stretching out on a lazy, weekend afternoon. Think sitting near a window might be too hot? A southern-facing window can be made tolerable with an application of solar window film. This type of product blocks heat. Besides its cooling effects, window film keeps furniture and books from fading. Window film also reduces the glare that can make reading on a screen difficult. If you can’t build a reading nook near a window, proper lighting can add to the environment. Even if your nook has good natural light, you may still need a lamp for dark days and late nights. For reading, an energy-efficient LED bulb with white light is the choice of many people. Next to lighting, comfortable seating is the most important element when you build a reading nook. If you have more than one bookworm in the family, be sure to make room for everyone. A combination of chairs, such as a window seat, a loveseat or an oversized beanbag chair accommodates a variety of preferences and sizes. Keep the area inviting by supplying extra throws and pillows. A cushy area rug can invite rugrats to sprawl or play nearby. If you want your nook to feel and look like a library, install bookcases. You can save space by hanging shelves on the walls. If you add free-standing furniture, get the proper hardware to attach them to the walls. No room for shelves? A basket or ottoman is a great way to store a few books and magazines. As you use the reading nook, you may find you want to add other elements. For instance, you can make the area more defined with the strategic placement of room dividers, curtains or standing screens. Add whimsical touches with decorative lights, an antique typewriter or other writerly touches. Pacific Window Tinting offers an array of practical and beautiful window film. Contact us to learn more about how window film can help when you build a reading nook. 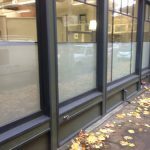 Should I Choose Blinds or Window Film for Office Privacy? A Window Tint adds Portland flair! Pacific Window Tinting is a female-owned business built on great products and exceptional service. Since 1998, we have been Oregon's most trusted and respected provider of premium window tinting for commercial and residential properties. Our window tinting services meet the highest standards in the industry. We ensure this is achieved in each and every project with our in-house crew of installation experts. None of the work is outsourced. Therefore, our staff from top to bottom has complete control over the quality of the work we do. Click here to learn more about us or call us today at 503.736.9000. Twitter response: "Sorry, that page does not exist"